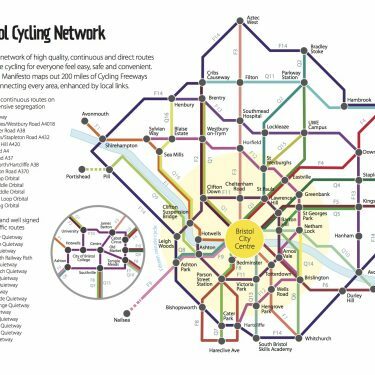 Here in Bristol we’re a long way ahead of many areas, and BCyC has blazed a trail with our Bristol Cycling Manifesto with its highly influential ‘tube map’. It will be no surprise that we’ve got a long list of priorities based on our detailed network plan, so we’ve had to work hard to distill these down to some specific routes that we want Bristol and South Gloucestershire to include in their first LCWIP (yes, Gloucester Rd is #1). [Cycle Bath have been doing the same with BaNES, see here, and we don’t think North Somerset are ready yet]. Here’s the BCyC submission, also copied below, LCWIP BCyC final13.8.18. Our Space for Cycling Forum of BCyC members will be closely involved in working with council officers as plans develop. We’ll see how far we get a meaningful plan with prioritised actions. Note that the LCWIP will form an action plan appendix to the Bristol Transport Strategy that is out for public consultation on 24th September 2018, watch this space for updates. New cycling infrastructure proposed as part of the Local Cycling and Walking Infrastructure Plan should be Triple A’ standard, that is All Ages and Ability. Cycling infrastructure should be safe for users of all experience from ages 8 to 80. On high traffic routes this means fully segregated from motor traffic. In busy areas this means separation from pedestrians for both speed and safety. Only in very low traffic environments should cyclists mix with other modes. Sharing with buses is not segregation. As a minimum standard Bristol’s LCWIP cycle routes must comply with the London Cycling Design Standards. Infrastructure forming routes should be designed with the continuity of the route in mind. Routes should be legible and not be dependent on signage to be followed. Cyclists on dedicated infrastructure should retain as least as much priority at junctions as one choosing to use the carriageway. Cyclists should not be required to choose between safety and convenience. At this stage we understand the need is for proposals and suggestions not planned or designed routes. Bristol Cycling Campaign’s Space for Cycling campaign group have used the propensity to cycle tool and members collective experience as cyclists in Bristol to identify certain routes that should be prioritized as part of the Local Cycling and Walking Infrastructure Plan. The proposals below are all suitable for high quality, high capacity cycling routes of the type classed as ‘cycling superhighways’ in London or proposed to be called “Beelines” in Greater Manchester. Gloucester Road is currently the busiest route for cyclists in Bristol and is a key North-South commuter route between the city centre and northern inner suburbs. Existing cycle lanes are inadequate, shared with buses or frequently blocked by parked cars. The LCWIP should include plans for Gloucester Road, for these purposes including Cheltenham Road, Stokes Croft and North Street. Connections to the city centre, must also be provided, with particular consideration to the St James Barton Roundabout which is presently a significant obstacle to cycling.. The Bristol and Bath Railway Path is a well used safe traffic free cycling and walking route, but suffers from poor connections to the city centre. The LCWIP should include a connection between the end of the path at Trinity Street and the east-west route starting at Castle Park. BCyC does not propose a specific route, but it should be direct and fully segregated from Motor traffic. The City Council has tried to develop a slow “Quietway” route using Bragg Lane, Redcross Street and the existing Old Market roundabout crossings (to be improved). We support that but the LCWIP should aspire to a more direct route which does not use a sequence of four crossings at which motor traffic capacity is prioritized. In addition to this, the section of the BBRP between Fishponds and the city centre is regularly very busy; a victim of its success. This section would benefit from widening and marking improvements, and perhaps segregation between cyclists and pedestrian, to increase safety and capacity, and reduce conflict. Whiteladies Road is identified as a key route in the Bristol Cycle Strategy (2015) and City Centre Framework (2018, under consultation), and is an important connection between the north west suburbs and the city centre. It is also an important link from student halls of residence and the Stoke Bishop Student Village to the University of Bristol. There are presently a number of sections of disconnected, unsegregated advisory cycle lanes along the length of the road which are obstructed by parked cars or shared with buses. This route should connect into cycle routes on the downs serving university halls of residence and residential areas with the centre via College Green and Park Street. This route could further be extended across and around the Downs for commuting and utility cycling purposes as well as leisure and improving non motorized access to one of Bristol’s finest features. This route needs to link to the Whiteladies Road route. Whether via Queens Road, Park Row, Perry Row, Upper Maudlin Street or otherwise the route should link, the University’s main site at Tyndall’s Park with the Bristol Royal Infirmary and on to the City Centre and Broadmead. The route suggested has a gentler gradient than Park Street and is therefore more accessible to more people. The Whitchurch way currently provides a traffic free cycle route out to and from south east Bristol and should be continued along the old rail bed from Callington Road Hospital/Tesco to St Philips Causeway. This would have the potential to unlock hillier parts of south east Bristol for cycling and connect into existing advisory cycle lanes along Bath Road. The proposed Brislington Greenway could be a vital link in this route. The LCWIP should contain a proposal that this route continues in a safe and segregated fashion form the City boundary at Whitchurch to Temple Meads station and Bath Bridges. There are three possible routes; the river Avon (the current path is inadequate and would need to be widened and, perhaps, built out into the river); Feeder Road and Bath Road. Large parts of south Bristol remain cut off from the city centre by bike. Existing routes are too narrow (Gaol Ferry Bridge), too inaccessible (Langton Street Bridge or dominated by motor traffic (Bedminster Bridge, Temple Gate). The refurbishment of Ashton Avenue bridge is a useful route but only to a small proportion of the population of the south of the City. The shared footpath is also too narrow to safely accommodate cycles and pedestrians in large numbers. The single biggest impediment to cycling from south to north Bristol is Bedminster Bridge gyratory. The LCWIP should include proposals for a high quality segregated cycle route running from Bedminster Parade to Redcliffe way. This would have the potential to connect up to new infrastructure on Clarence Road, Bathurst Basin, Redcliffe Bascule Bridge and connect to the cycling contraflow on East Street. The LCWIP should contain a proposal to produce a high quality south Bristol route. The rough course of the current Malago greenway could be a guide. That route goes in the right direction but is thoroughly inadequate; it is inconvenient, incoherent, not fully segregated, involves pavement paths and inaccessible barriers. As a consequence it is little used. The aspiration should be to create a first class segregated route branching out to Withywood and Hartcliffe. North East Bristol is well served by the BBRP although there are capacity issues (see above). East Bristol itself is less well served; despite being densely populated. There is a need for a cycle route along or roughly parallel to the A420 Church Road. This would also provide relief for the BBRP. There is a cycle route (the Wesley Way) of very low quality. One possibility is to use filtered permeability on Beaufort Way and other roads or a neighbourhood treatment. North – South and East -West routes across the City Centre need to be completed as well as other routes. This needs to be provided for in the LCWIP. For example with Nelson Street as a bus and motor route there is a need for a safe link between the City Centre and Broadmead and beyond. It is important that the Bristol shopping area of Broadmead, the Galleries, Cabot Circus, the Horsefair and the new Callowhill Court development do not constitute a large area effectively impermeable to bikes (although cycling is permitted; crowded Broadmead is not a useful cycle route). Brunel Mile needs improvement. A route between Temple Meads station and the City Centre, possibly via Victoria Street, is required. The cycle routes planned as part of the Temple Quarter development need to be completed to a high standard. This route to North Somerset already has some quality sections. It needs to be complete, continuous and of high quality from the city Centre to Long Ashton; whether by a renewal and improvement, including to the surface, of the Chocalate Path or otherwise. There is a very poor missing link in Bower Ashton. This is a reasonable route from Hotwells to Shirehampton. It could be upgraded to AAA status relatively straightforwardly. Routes along rivers are ideal for fully segregated bi directional cycle tracks (eg Embankment in Central London, Portsmouth Road in Kingston upon Thames). The route from Hotwells to the City Centre should be in the LCWIP as it needs considerable amelioration. A cycle route along Hotwell Road and Anchor Road should be considered as should extensions or build outs into the harbour in Hotwells. There is a need for a high quality route between East Bristol, with its large population, and the North Bristol Fringe, where large numbers of people work or study. Current routes involve steep gradients and/or long detours and this needs major improvements. In addition to the route and network based proposals above the LCWIP should include plans for traffic reduction schemes in neighbourhoods for areas between arterial routes. The success of the Walthamstow mini-Holland in north east London offers a model for future projects to reduce traffic levels and improve the liveability of residential areas. The use of various modal filters is a low intervention means of reducing motor traffic and making streets safer for walking and cycling. This is a London specific document but the principles apply to most cities, certainly Bristol. Within about a decade and for tens, not hundreds, of millions of pounds Bristol could be transformed into a modern northern European city, with cycling and walking as the dominant modes for travel under 7 or 8 miles, including for most work and educational commutes. The City environment, air quality and public health could be vastly improved by these simple steps. Cycling will not be for everyone, or every journey, any more than bus travel, trains or motoring are for all people and all trips. Longer journeys, journeys carrying goods and multiple people, will continue to be made by other modes, including motoring. People need access to homes and most businesses by vehicle. Many journeys, particularly where speed and reliability are less of an issue, will be made by bus; not, one hopes, because there is no other alternative, but by choice. Putting in safe cycle infrastructure is cheap, quick and easy, compared to surface Mass Rapid Transit, light rail or fast buses. It is far, far less expensive than surface MRT let alone the billions required to fund an underground railway. It will take years (3 years for the London East West Cycle Superhighway; one year construction) not a decade like surface MRT (12 years for Metrobus; four years construction) let alone a generation like an underground. Safe cycle infrastructure will require some reallocation of road capacity, particularly at “pinch points” and prioritizing people movements not vehicle movements. It will not however require the extensive building of new roads; unlike surface MRT (eg Metrobus and South Bristol Link, Callington Road Relief route) which has, at least so far in Bristol, been reasonably characterized, as new roads with an attached bus scheme rather than visa versa. Cycling, together with walking, is a reasonably quick, cheap and very practical part solution to Bristol’s congestion and air pollution problems. It is not a magic bullet but it can alleviate the situation considerably. Politically it will excite opposition, as change always does, but it will also garner support; usually more support than opposition (eg the Mini Hollands). Certainly it is politically vastly easier than Congestion or Workplace Parking Charging at a level necessary to fund MRT; where the cost is immediate and very real and the benefit long term and uncertain.